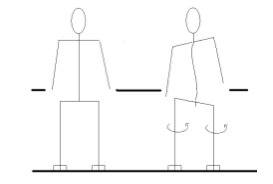 In the diagram below, it can be seen that the figure on the left has even leg lengths. The pelvis is horizontal. The spine comes out of the pelvis at the sacroiliac joints at 90 degrees and is therefore also straight. The shoulders come off the spine at a 90 degree angle too. Because what is below them is straight, they too are well aligned. The head is upright. The spine curves, usually in an S shape called scoliosis although a C shaped curve is also possible. This diagram only shows the side-to-side plane changes. Similar effects are found in the front-to-back plane as well, i.e. looking at the body side on in profile. Pain is usually located in the back, shoulders and neck. It is quite common to also have foot and knee symptoms on one side and hip symptoms on the other. The right way to approach this problem depends a lot on the age of the patient. If young (under 10) a simple raise in the shoe to make the legs the same length may be all that is required. If the person is over 70, it is unlikely that much raise will be tolerated as the body will be too set into the bad position. Between 10 and 70 years of age, a greater or lesser amount of raise will be tolerated. After adolescence and through adulthood, it is likely that anyone with a limb length difference will need to wear shoe inserts to stop the leg and pelvis rotations. Simply adding a raise to the short side usually fails as it does not stop the compensation mechanisms already in place. See a podiatrist to be properly assessed and treated.